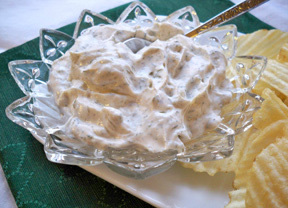 If you like green olives you will love this tasty dip. 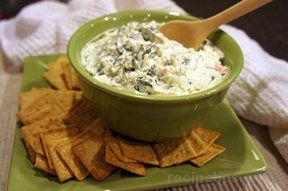 It is simple to make and goes great with your favorite crackers or dipping chips. Beat the cream cheese until it is smooth. Add the mayonnaise, olive juice, and sliced olives. Beat until all ingredients are well mixed and the olives are slightly broken up in the dip. 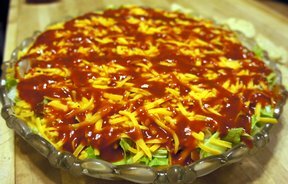 Refrigerate until chilled; serve with crackers or chips. "This is good stuff! I added a bit of my own twist. 1/2 white onion that was chopped in the food processor with the olives. I also added 1 tsp garlic powder and 1 tsp onion powder and as a kicker I had a jar of jalapeño peppers in the fridge. I added 1 Tbsp of the juice from the jalapeños to kick it up a notch! MMMMMMMMM MMMMMMMM good!" "A friend of mine made this and brought it on a weekend trip that we went on. It was great. I made it for my kids when I got home and the only ones that didn't like it were the ones that don't like green olives. 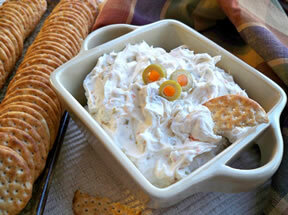 I love the little bit of saltiness the olives give this dip."